Being addicted to gambling, murdering your wife and obsessive nail-biting have something in common: they all can be prevented by replacing bad habits with good ones. The simple, but essential insight from this book is that one has to see the habit to be able to change it. This goes for individuals, organizations and societies. Especially organizations may seem to make rational decision based on facts, but instead firms are guided by long-held organizational habits, patterns that often emerge from thousands of employees’ independent decisions. Habits can’t be eradicated, they must be replaced. As new CEO of Alcoa, Paul O’Neill was successful by`focusing on one critical detail: employee safety. He demanded the number of accidents on the work floor to be reduced to zero. This approach seemed totally irresponsible to many investors, but proved to be the trigger for a huge increase in net profit – while enhancing employee satisfaction and almost eliminating accidents. Because employees had to communicate more, outdated machinery was upgraded and priorities were made clear. People started to care about their company; it became a great place to work. O’Neill had found the one key habit that had to be changed in order to start a process that over time changed everything. Within companies, institutional habits are known as routines. A leader not only has to find the right trigger – and those so-called keystone habits are tricky to find – but he also has to believe in this change. O’Neill did both and was highly successful (his approach was less successful as Secretary of the Treasury under President George W. Bush, who fired him in his second year on the job). The book relies heavily on well-known research (e.g. will power can be trained as a muscle, change is easier in groups, the relativity of the free will), but Charles Duhigg has this great American storytelling quality that makes the book a pleasure to read. Duhigg enhances this pleasure by inserting a ‘reader’s guide to using these id eas’. The four steps we have to take whenever we want to successfully change a habit are: 1) identify your routine 2) experiment with rewards 3) isolate the cue 4) have a plan. 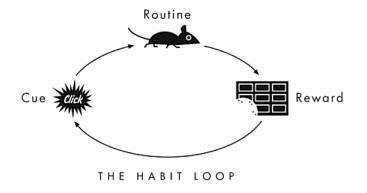 They can be summarized with ‘the habit loop’. This positive can-do mentality based on knowledge and control (you’re the change that you want to be!) is inspirational, but, to me, is only half the story. At least equally important for our success in life (from business to marriage) is how creativity, serendipity and sheer luck impact our daily routine. Not acknowledging those factors, might make implementing the book’s practical lessons a lot less satisfying than we would like.